As of June 2014, ETHOS have made the decision NOT to recommend the Fansipan Climb. The mountain is an ongoing building site as the various phases of the cable car constriction impact the summit. Operated by multinational chain, Sungroup, there is now a cable car station, Buddha statue, furniclar, modern temple, shops and services towards the summit. These facilities have degraded the social and environmental conditions in Sapa and within the Hoan Lien Son National Park. All Fansipan Treks are organised through the Hoang Lien Son National Park Authorities. Unlike all of our other treks, ETHOS Adventures do not select either the guide or porters for this trekking option. Whilst we do our best to provide detailed feedback to the National Park, we have no control over guide selection, nor in determining a fair price for their services. This trek provides plenty to see and absorb. Trek from Tram Ton (1957m) for about 2,5 hours with some short breaks along the way to a resting place at 2,200m. This part of the trail is fairly easy, not very tough or steep. There are some long ascents which take from 30 to 45 minutes and three short descents from 5 to 15 minutes. A lunch break is taken near a little stream. The afternoon trek gets a lot tougher as the trail winds its way up the steep mountain side through bamboo forest mostly uphill for nearly 4 hours. There are 4 tough ascents which take from 15 to 40 minutes. The rest of the trail is a combination of easy descents and even and gradual ascents. Hopefully, if the clouds break, you'll have panoramic views of the Hoang Lien Son Nature Reserve and be able to celebrate your achievement at the summit. YOU SHOULD BRING: Strong and comfortable trekking shoes, waterproof jacket, suitable clothing, mosquito repellent. Day 01: Depart at 08.00 - 09.00. Transfer by road for the 16km journey to Tram Ton Tram Ton Pass and the entrance to the Hoang Lien Son National Park. The hike starts from Heavens Gate in the morning with a break for lunch. You will follow the forest path with small bamboo trees along to start your conquering of Fansipan peak. Stop for a picnic lunch then continue your trip. At 17:00 you will stop for dinner at the base camp at the height of 2,800 metres with sleeping facilities in huts. 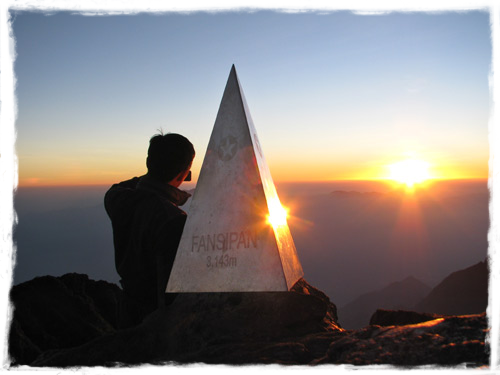 Day 02: 06:30: After breakfast, we will continue our trip to the summit of Mount Fansipan (3143m). 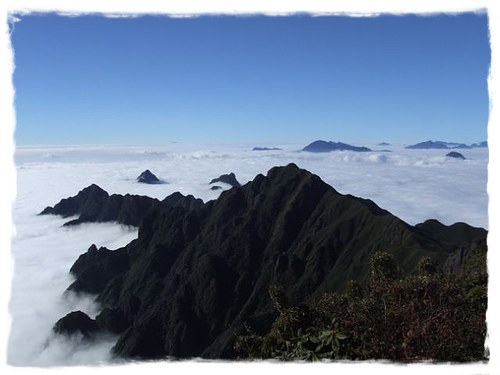 You will reach the top of Fansipan peak by mid morning. There will be opportunites for you to take photographs and celebrate your aceivement. After that, you will decend to a height of 2,800 metres for lunch. In the afternoon, you will follow the path through the bamboo forest back to the National Park Headquaters before returning to back to Sapa by road transport. Expect both days to involve 6-8 hours of hiking / climbing. The trek is do-able in normal hiking boots.